Pirnar company was established in 1968. It all began as a small handcraft shop which gradually over the years grew to big successful family business with over 200 employees. Vision of the company is to produce the best entrance doors in the world. They push boundaries and every year present new innovative features of entrance doors. Pirnar doors are well known and sold all over the world. They are uniquely designed and made from high quality materials. Every doors are perfectly shaped and superbly constructed. Pirnar company was first to create doors which were 14 cm thick. This kind of thickness provides excellent temperature and sound insulation. Their doors can be produced in nonstandard sizes with maximum measurements of 130 x 300 cm. Usually they are installed in spacious villas, marvellous mansions and other residences with high ceilings. Pirnar doors are handmade masterpieces which have many innovative features like fingerprint recognition system, hidden door handle, different illumination options, sleek and elegant design just to name a few. Fingerprint recognition system which is named One Touch got a prestigious German Design Award 2017 which is presented for exceptional and pioneer achievements in design. One touch system is very practical, no keys are needed to lock and unlock the doors. Another innovative feature od Pirnar doors are retractable handles. When One Touch system recognizes fingerprint, handle gently pulls out and illuminates surrounding with discreet LED lights. After few seconds, handle retracts in a door surface and becomes invisible. This is a great safety feature because doors can't be manipulated in any way by non-residents. Pirnar doors can also have additional safety features like coded keyboards, locks with multiple massive hooks which can have automated locking system, partial door opening feature and motorized locking and unlocking. Pirnar doors are made of wood and aluminium or combination of both. Aluminium doors have more modern look and are usually used for contemporary buildings. Wooden doors give traditional homes warm and inviting feel. 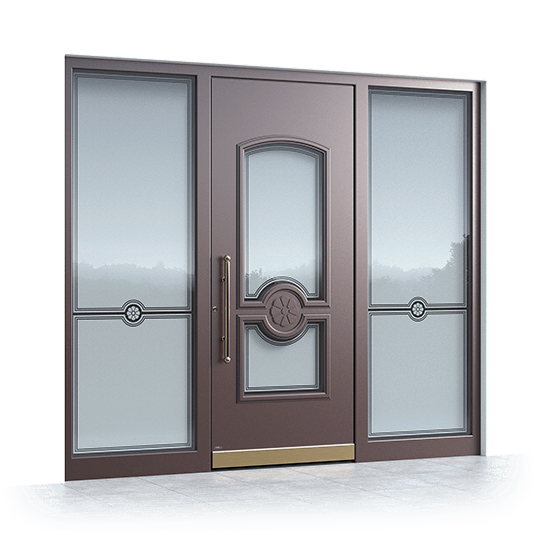 Doors can also have glass windows which are decorative and functional. There are many types of glass to choose from including beautiful stained glass. Doors are produced in many colours which range from white to black. Colours of Pirnar doors are arranged in five groups: standard white in mate or high gloss, colours according to RAL scale, smooth mate colours, wooden décor, metal and fine structured colours.